So yes. It has finally happened. 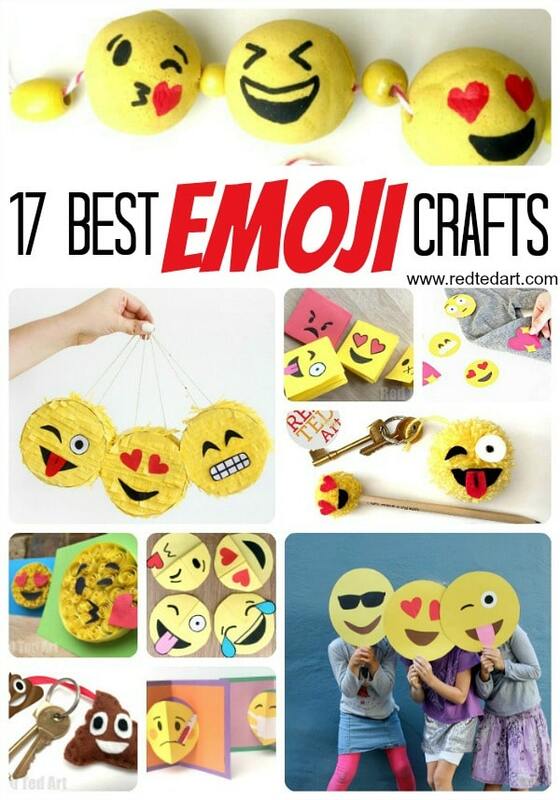 I have “enough” DIY Emoji Crafts for Kids, to put together a collection for you. It is a sign of the times.. my kids are growing up.. and so are their desires to move on from lovely preschool crafts and more “generic” crafts for kids (though of course they still enjoy these.. just every so often, they want something a little more contemporary!). Having said that.. aren’t emojis what used to be “smiley faces” in our day (or certainly MY day.. I remember making many a smiley badge to wear). 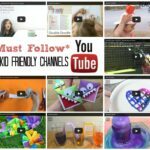 So it is with great excitement that I finally bring you this list of fun emoji crafts for teens, tweens and kids! Actually, maybe the odd grown up too. There is a real mixed bag here and I will talk about each a little as we go along. 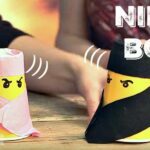 I do hope you enjoy checking these emoji DIYs out as much as we have making them!!! Remember, I LOVE to add to these sorts of lists.. so please do check back occassionally to see if we have updated the list and introduced more emoji DIY ideas! First up we have the Emoji Bookmarks – sooooo, this is where all our EMOJI crafting began. In fact, I believe these are the emoji DIY that also really kick started my youtube channel (check it out if you haven’t already). The kids on YouTube were going bananas over my Corner Bookmark Designs. I decided to have a go at some Emoji Bookmarks. Say no more…… bananas and LOTS of bananas it was. It started off with just some smiley faces.. but later, I also added an Emoji Ghost, Emoji Pumpkin, Emoji Dog and an Emoji Poop! So do check out the whole bookmark collection. One of our more recent easy emojis, are these Emoji Mini Notebooks. Based on the oh so popular No Glue Notebooks, I thought I would have a go at a square notebook version. The square books were better for that every way symmetrical emoji face. They turned out fabulous and was another great hit with the kids! I adore these Emoji Quilled Card (with Love version) – as not only do they look fanatstic, but they introduce kids to a new technique – paper quilling. But in a really easy and “low tech” manner. Seriously, they will love them. And nothing quite like exploring a new skill! Similarly, we adore making POP UP CARDS, here is a simple technique, than can easily be turned into an Emoji Pop Up Card – this time we focussed on “Get Well Soon” emojis. But of couse you can pick whichever character is your favourite! and here is another great pop up emoji card diy – check it out! 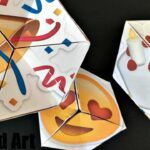 There are two versions of this Paper Spinning Toy – a colour theory exploratory one and an Emoji Spinning Toy – I think you will enjoy both! Next up, there are these great Party Emoji Kaleidoscope printables. Print. Cut. Assemble. Perfect as a birthday party activity (older kids) or to keep kids busy on New Year’s Eve! 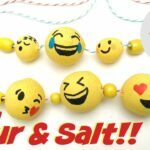 A slightly more ambition project where our DIY Emoji Beads – yes, we made these beads from scratch – salt, flour and some food dye.. and you get these amazing looking emoji beads. 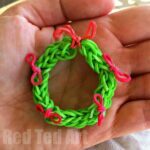 They are a super thrifty craft that kids can make. Love them to bits! We find Pom Poms totally irristible and they make WONDERFUL Emoji Pencil Topper or Emoji Zipper Pulls or Key Chains. One craft, your choice how to use it! 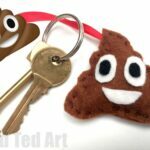 If your kids are learning to sew, here is a neat little project that is quick and easy and of course lots of emoji fun – make your own Poop Emoji Key Ring! A great gift to make for friends too! If “no sew” is more your thing, you can make this quick and easy Emoji Pencil Roll – ok, so it is “just a” pencil roll.. with a small Emoji decoration.. but still fab, right? 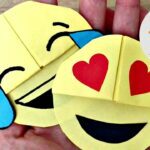 Though I think MANY of the DIY Emoji Crafts shared above are also suitable as party crafts.. here are some more specific for an emoji themed party! Slowly coming to the end of our list with these fun and Easy Emoji Masks, feeling bashful about dressing up for a party? Dress normally, make your mask. And sorted! Last but not least we have a choice of large Emoji Pinata or Mini Pinatas– which ever takes your fancy first! 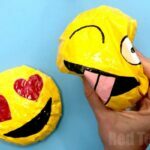 Love this DIY Emoji Slime – perfect as party favours! Isn’t she so very talented?! Love! So. 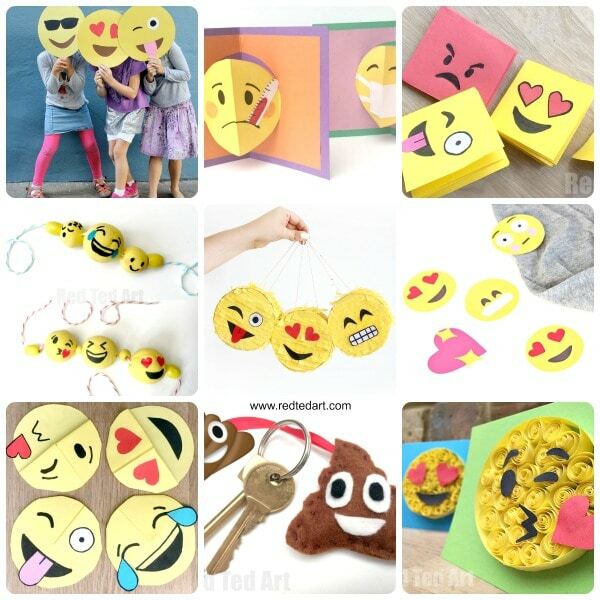 This is it for our Emoji DIY Crafts inspiration. I hope you liked these as much as we do and that you have a go of at least 3 of them!!! Maggy: Thanks so much for your emoji crafts. I had a birthday party for my 7 year old granddaughter who loves emoji everything! We made the little notebooks, they played with the flextangles, made the cookies, and they made their own face size emojis. All had a great time, I couldn’t have done it without you, and your videos! Thanks again, a fan of Red Ted Art-Carol B.
Oh wow! So pleased to hear it! !